"This ceviche is very easy to put together, using white albacore really makes the difference, fresh taste and a firm texture come together to prepare a delicious meal." Place tuna in a mixing bowl. Add the lemon juice, salt and pepper. Let sit for 10 minutes to blend flavors. Add chopped tomatoes, cilantro, and purple onion to the bowl. Combine well; season to taste with additional salt. 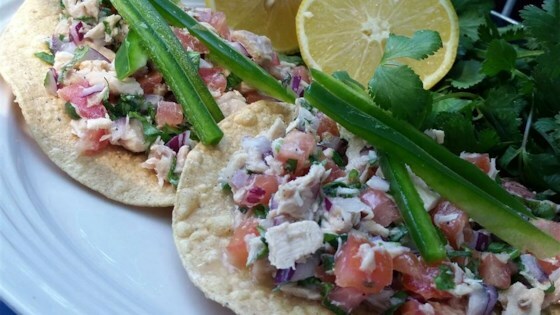 Serve white albacore ceviche over the tostadas and garnish with jalapeno strips. This was so delicious! I eat low carb so I ate it mixed with an avocado instead of using the tostada shells. Made the perfect lunch! Thank you!